The Union Steel Company building on N. Huron Street is located just north of Washington Gardner School. The company ceased operations in 1969, leaving behind a vacant lot and production facility. The lot was classified a brownfield, a contaminated site that contains heavy metals and acidic materials. Phytoremediation (also called phytoextraction) is the process of using plants to degrade these contaminants and restore a healthy environment. 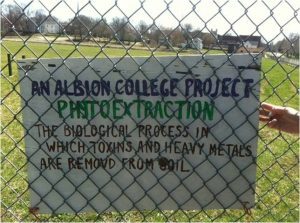 Albion College established a Brownfield Phytoremediation Project, with cooperation from the Albion Brownfield Redevelopment Authority, and students were able to successfully convert the brownfield into an Albion city dog park.